From what I have read I can see he has left a beautiful legacy for us all. God Bless he and his family and friends. Thank you Lord for the blessings of bringing this man to us. God Bless all. I am sorry to hear of the passing of George Ramos. 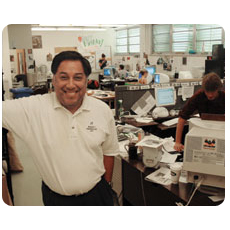 It is a deep loss to both CalCoastNews and the Cal Poly Journalism department. In the early days, CalCoastNews sometimes seemed to play fast and loose with the facts. Since George Ramos came on board, there has been much more attention to checking the facts and obtaining the background. He seems to have been instrumental in the improved quality and maturation of the site. My sympathies to his friends and family – and especially those journalists he inspired and nurtured. It is in the saying of this prayer in the passing of Mr. Ramos, I express my sadness at his death and extend my condolensces to his family, friends, and colleagues. I am so, so sorry I never met him. Truly my loss. Bright blessings. Just a note to say I am so sorry for your loss. Like so many others I have enjoyed reading his writings over the years. At times like these we try so hard to search for the right words to express condolences. You were a good friend to him. Here is the Los Angeles Times coverage. Love that photo! According to Tibet belief, you soul still circulates in out of body examination for 9 days. Because the body (temple) has given out, the Astro-cord cord is now cut and you cannot return. And in the end , it’s not the years in your life that count. It’s the life in your years. Life is Pain and suffering, suffering being optional. The pain and suffering in life we all undergo is an energy form, you CCN have offered truth (many feel and dare not say – transparency) to set many free and an outlet to vent among the council of many educated and wise (Book of Proverb) that post here. Moreso, you have been blessed in your last days with the best support staff anyone can have (Karen and Dave). I had the honor of him being one of my mentors in Puerto Rico one summer. When I first met him, I was scared, more intimidated. Then he sat next to me and made me laugh hysterically. He pushed me so hard those weeks. I didn’t understand why. Then he pulled me aside and told me why. He saw something in me that he truly believes in. We corresponded back and forth for some time after that. He not only helped me as a writer, but I really think George brought out the inner Latina in me and who I really am. He inspired me to write about what I know best…ME! George was one of a kind. He was special and I will miss him greatly. More evidence that, “The good die young”. Condolences to his brother. level classes was journalism 203 with Ramos. I have to admit, initially I was somewhat intimidated going into the class, not knowing what to expect or what kind of professor Ramos would turn out to be. that maybe I do have what it takes. I will miss having him as a teacher and hearing all the exciting stories he had to share about his time as a journalist.